Vanga curvirostris Linnaeus, 1766. 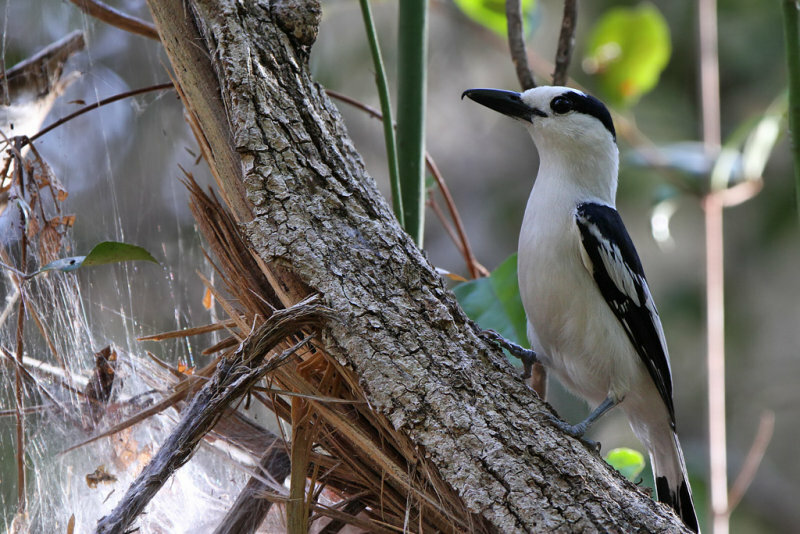 The hook-billed vanga is in a genus of its own. There are two subspecies, the nominate, which is widely distributed in rainforest and west of Madagascar, and V. c. cetera, limited to the southern spiny forests. French: Vanga йcorcheur; German: Hakenvanga; Spanish: Vanga de Pico Curvo. 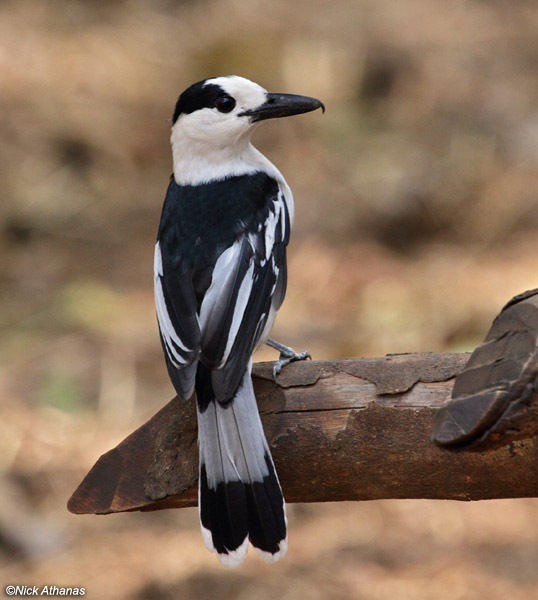 PHYSICAL CHARACTERISTICS The hook-billed vanga has a slim body, short wings, long tail, a long neck, a relatively heavy head, and a thick black bill. Male, female, and juvenile are similar. The underparts are pure white, the head has a black napeband. The mantle is also black, with wide pale fringes to the greater and median coverts. The base of the tail is pale gray. 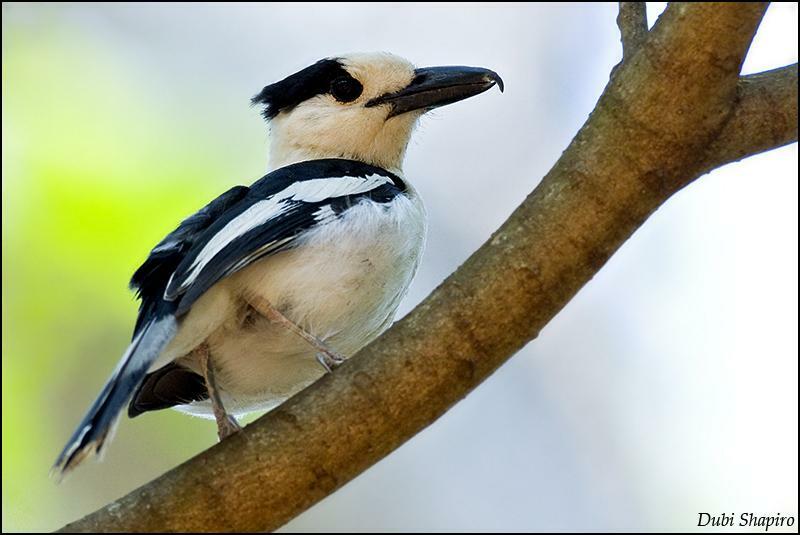 The hook-billed vanga occurs all over the east in plantations not too far from primary forest, gardens, lowland, and mid-altitude forest. It is relatively scarce in rainforest. It is absent from the high plateau except in large areas of primary forest. In the west and south it is more common, especially in the fringes of primary deciduous and spiny forest. 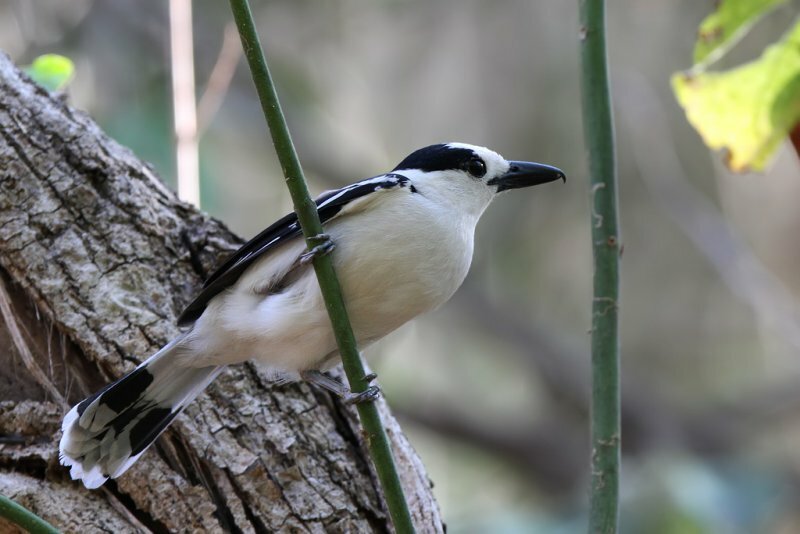 In the east, the hook-billed vanga is largely a bird of forest and forest edge, though occasionally found some way from the forest. In the west, it is found most commonly in dense forest, particularly around regenerating gaps. 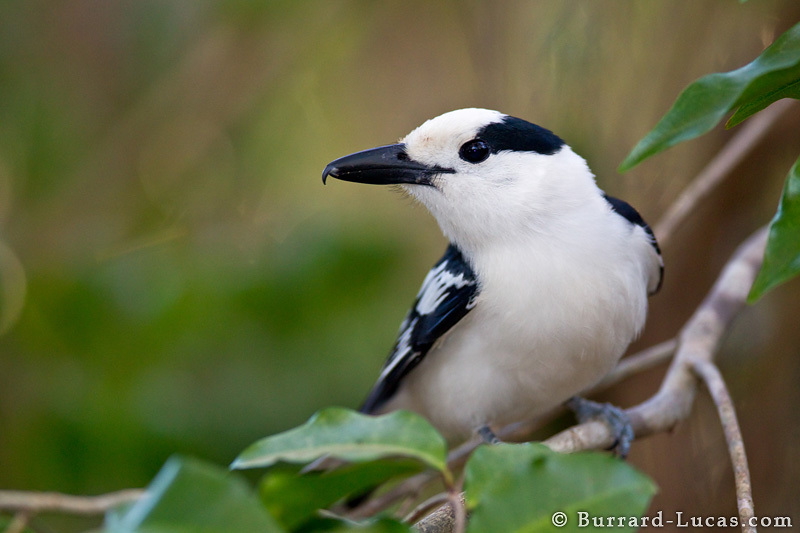 The hook-billed vanga is often difficult to find, as it feeds high in dense vegetation. The song is a short high single whistle, very difficult to locate. Imitiation of the song will often bring the bird flying in overhead to investigate, as they are very territorial. They do not really follow mixed-species flocks, but they are sometimes seen on the periphery of groups. They are usually seen in pairs, although the couple may be widely separated. The hook-billed vanga forages mostly in dense vegetation where it will tear open leaf-clumps or loose bark in search of invertebrates. When looking for chameleons, the hook-billed vangas move rapidly through the understory, hopping from vertical stem to vertical stem, looking intently for the shapes of chameleons. Hook-billed vangas take prey up to the size of a medium-sized chameleon or a bird or bat. The pair constructs a nest in the fork of a tree, often quite low down, and the female lays in it two or three whitish or reddish eggs. Pairs seem to be very territorial, and singing birds from adjacent territories may end up fighting or loudly bill-clapping at each other. , the hook-billed vanga is not considered threatened.